YouTube has more than 1 billion users — almost one-third of all the people on the Internet — watching a billion hours of content every day. For a business that’s a huge potential audience. If you use YouTube as a channel for your product marketing and brand building, you probably understand how essential it is to analyze your activities: which content works for you and which doesn’t, which videos your audience likes, and how your audience changes over time. And that’s exactly what the YouTube Report is for — keeping all the necessary information on your and your competitor’s performance in one place. 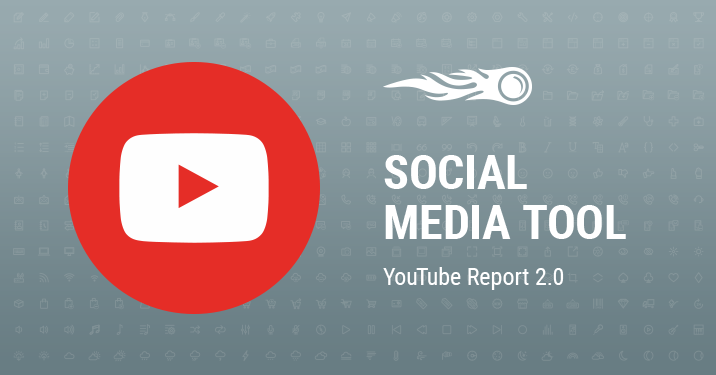 As you may know, we keep working hard to improve the Social Media Tool and expand its reports with new detailed metrics, so the YouTube report is no exception. Now we’re pleased to provide you with broader analytics on YouTube, which gives you the capability to not only view basic video metrics, but to track the audience activity and interest trend for every video posted by you or your competitor. The new metrics on likes and dislikes allows you to study engagement from all angles. Let’s take a closer look at the improved YouTube section and at each of its reports. The Post report allows to view your or your competitor’s posts within a selected time period and find those that you are interested in by sorting them according to different parameters — date, engagement rate, number of likes, dislikes or views. The Audience report provides you with information on how your follower count is changing, and you can compare it with your competitor’s. The brand new Activity report allows you to check video publishing trends and performance against your competitors. The Engagement report gives you an in-depth review on how audience engagement is distributed and how it’s changing over time. What do you think about the Social Media tool’s recent enhancement? Share your comments and thoughts at [email protected], and stay tuned!